Race for Hope DSM is an annual event inspired by 16-year- old Des Moines native, Nicolas Lovan. In November 2012, doctors diagnosed Nicolas with an inoperable brain tumor. Despite recently having brain surgery, Nicolas had an immediate desire to become an advocate. In May 2012, Nicolas and his mother attended the Washington, D.C. Race for Hope to raise funds for the National Brain Tumor Society and advocated for more research and funding by meeting with Congress at the White House Head to the Hill event. The Washington, D.C. Race for Hope inspired Nicolas to host a similar event in Des Moines with the goal of becoming an annual event during Brain Tumor Awareness month in May to bring awareness to the cause, raise funds for research, bring the community together, pay tribute to those who have passed and celebrate survivors. Race for Hope DSM launched in May 2013 with 600 participants and raised more than $25,000. 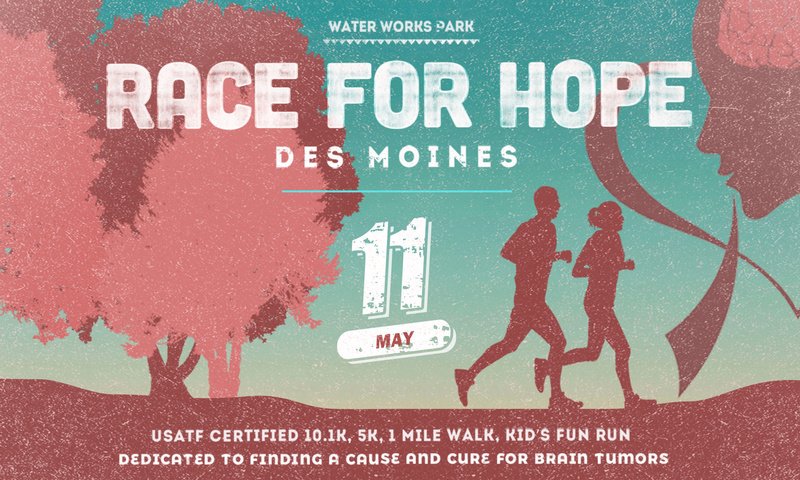 Over the past five years, Race for Hope DSM has raised more than $160,000 for brain tumor research. The all-volunteer staff prides itself in keeping costs as low as possible in order to maximize proceeds sent to brain tumor organizations. BRAIN TUMOR FACTS: Each year, more than 69,000 people in the United States are diagnosed with a primary or metastatic brain tumor. Today, nearly 700,000 people in the United States are living with the diagnosis of a primary brain or central nervous system tumor. Brain tumors are often deadly, impact quality of life, and change everything for patients and their loved ones. At this time brain tumor research is underfunded and the public remains unaware of the magnitude of this disease. WE CAN’T reach our goals without you! Please take a moment to look around. We have included pictures from the past years as well as photos of our inspiration. If you would like to learn more about brain tumors, visit our resource page for some downloadable pamphlets. If you would like to be more involved, we would be excited to have you on the committee! Just contact us using the link above. As always, follow us on Facebook or Twitter for the most up to date info.